When the original Emma was developed, the world witnessed a revolution in performance, quality and value. The completely redesigned Emma EVO accomplishes the seemingly impossible task of improving on all of these areas. As the top of the EgglestonWorks Artisan EVO series, the Emma is the result of a comprehensive research and development program whose goal was to create a range of affordable loudspeakers, which maintain the sonic and aesthetic excellence for which EgglestonWorks has long been renowned. The EVOlution embodied in the Emma first originated with the Viginti Limited Edtion speaker and then in the Kiva. 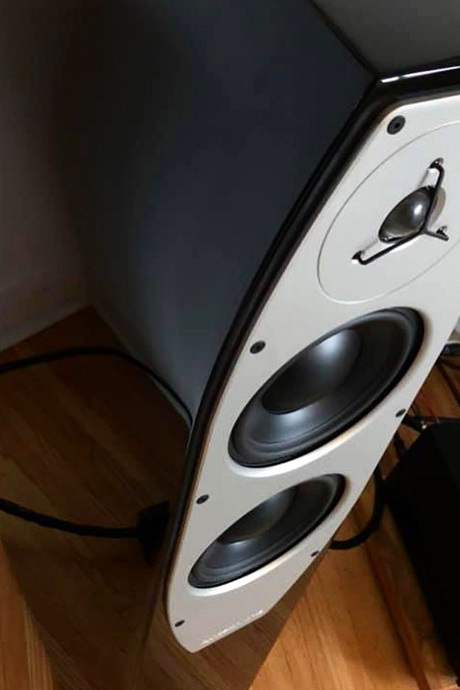 Both of these speakers feature a completely re-designed cabinet, internal bracing and porting systems, which were new to any previous EW product. In keeping with our tradition of trickle down R&D, the Emma benefits from the exact same cabinet advancements as the much larger speakers in the line. Redesigned drivers and crossover networks round out the improvements to insure the Emma EVO attains the highest quality sound delivery possible. A true hallmark of EgglestonWorks’ design philosophy is to create the absolute best speaker at any given price point. This might sound logical–doesn’t every company want to make the best speaker possible? — But the imperative to produce a complete product range often raises concerns that a particular model might be “too good,” have “too much bass,” for its price point, thereby stealing sales from other models. EgglestonWorks doesn’t share this belief. Our goal is to make every speaker we produce the absolute best performer that it can POSSIBLY be for any given price level. Compared to many of our competitors, EgglestonWorks offers a small collection of models and each speaker within our product line is intended to deliver state-of-the-art sound quality within given parameters of room size, gear and budget. This approach guarantees that each EgglestonWorks model is an exceptional value as well as a superb performer. Emma EVO delivers the quality and beauty of cost-no-object speakers at a real-world price. Listen and be impressed!